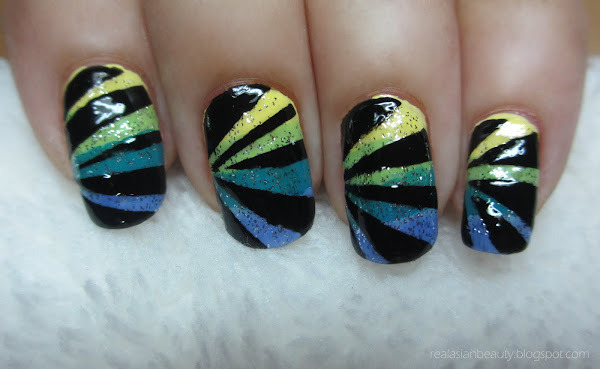 I really love nail art but sometimes creating a simple straight line could get a bit difficult. Here's a trick on how to create simple nail art with sleek straight lines. I used yellow, green, blue and violet but you could also use colors of your choice. Pink gradient would be pretty, too. Also, masking tape would be easier to use since scotch tape is transparent, however masking tape is color white so you will know where you are placing the strips. This is one of the easiest nail arts that I have created. Just remember to let the layer dry before doing the next step. Do you like this design? Please comment down below. And don't forget to check out my YouTube channel for more videos.